If I have an iPhone and it is using a local calendar ("On This Phone", I think), and my backup is to iCloud, does that backup include the local calendar? iPhone A shares an iCloud calendar with iPhone B. It all works as expected. The calendar is name "Calendar"
iPhone B now has iCloud calendars only; the iPhone B user checks on their Mac and they now see the iCloud calendar on their, too. Yay! iPhone B now shares their iCloud calendar with iPhone A. The calendar is named "Calendar"
Upon seeing this, the users of iPhone A and iPhone B tried things like: un-sharing and re-sharing, re-naming calendars, re-synching... None of which worked. 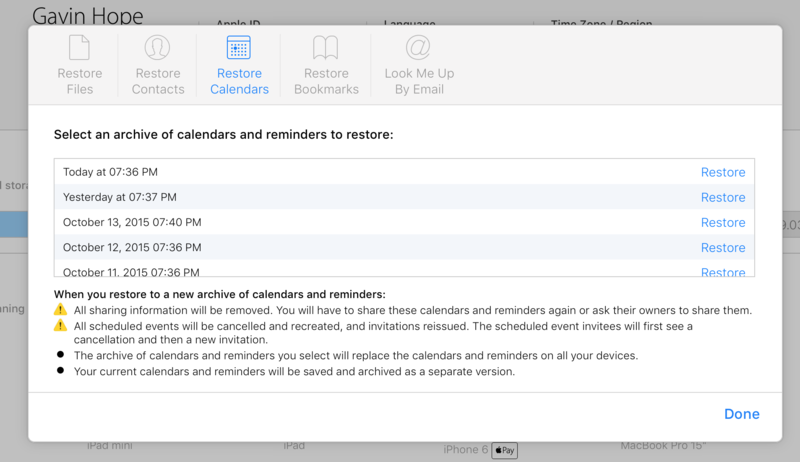 Although it doesn't say so explicitly, it makes sense that these iCloud calendar backups cover a user's iCloud calendars. (Plus, my attempt to restore such backups with a hope to see pre-merged, local calendars, failed). (2) The iPhone backup (the complete backup of the whole phone), which in my case was being backed up to iCloud (rather than iTunes), would, I presume, include the local calendars and their events. However, by time I'd got to looking at this, my oldest 'complete' iCloud backup was just a day old... which was after I merged the local calendars into iCloud calendars. Not the answer you're looking for? Browse other questions tagged iphone icloud backup calendar . iCloud share group of calendars? Is it possible to add iCloud Reminders to iCal calendars? How can I recover iCloud Calendar backup to iPhone 4?